I have a chequered swimming history. As a small child I was rubbish in swimming lessons (too easily distracted) but didn’t let this stop me jumping into the deep end of swimming pools without wearing arm bands. And not being one to let optimism be outweighed by experience, I didn’t do this on just the one occasion… If nothing else, I proved at an early age that I wasn’t a witch. Eventually, I did get the hang of floating and even notched up a few swimming badges along the way, but I haven’t swum much as a grown up. We’re lucky enough to have two pools in reasonable distance and I have graced both with my presence recently. Some things seem to have altered somewhat while I’ve been away, I’m still somewhat fazed by the concept of a ‘Changing Village’ for instance. Anyway, this morning we made it into the water by 9 o’clock and had just enough time for 22 lengths before it started to fill up at what we call Noodle Time (when families appear with various floats and small children chase after things thrown for them, like excited spaniels in the park). Three lanes of the pool are dedicated to lane swimming, but I’m still too nervous to even consider splashing my way down one of those. I do however look on in awe at the Amazonian women in the fast lane; they are broad of shoulder, sturdy of thigh and look like they could wrestle an alligator should one be foolish enough to venture into the baths. 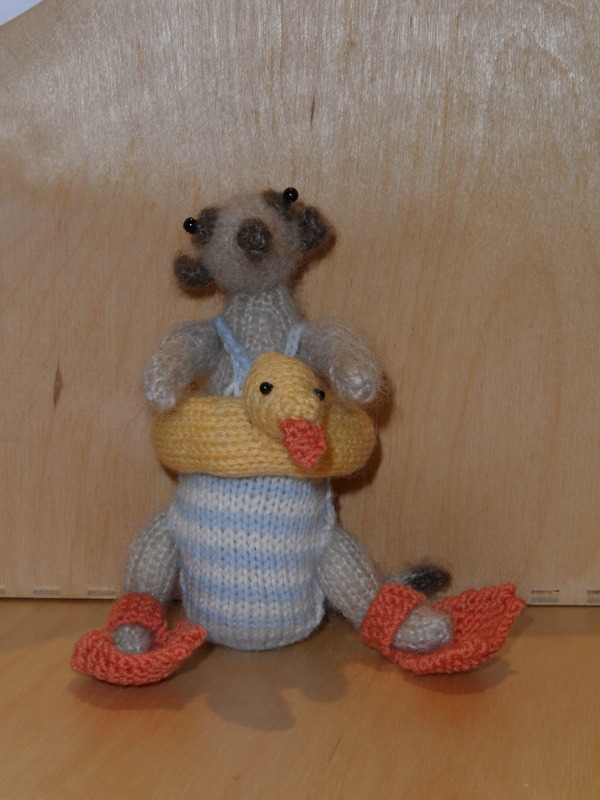 No one wants to see a picture of me in a swimming costume, please accept a knitted flipper-wearing meerkat as an alternative. Oh, and Flymos… Well, when the Flymo was first invented, people weren’t too convinced by the concept. Until then, lawn mowers had been feats of engineering brilliance, built to last and weighing a ton (at one point they were categorised by the amount of pulling power needed to shift them – one man, man and boy, two man, one horse, one elephant etc). The funny-looking Flymo was made of plastic, seemed flimsy in comparison to what people knew and the public needed convincing. The Flymo people went door to door inviting the ladies of the house to have a go with it in order to demonstrate just how simple and light-weight it was to use. Clearly knowing where the decision-making power lay in most homes, they asked 5000 women what colour they would like their grass cutter to be and the resounding answer was orange. Well it was the Sixties. I am scared to go in swimming lanes. Am terrible swimmer, yet apparently I am qualified to save people from drowning. Hats off to your 22 lengths. Maybe I will go swimming this week and follow your example. But I’ll probably do 2 lengths. That is a fine meerkat and a fine number of lengths. The meercat looks fantastic! And well done for the swimming. My pool has a slow lane for slower swimmers doing lengths. Maybe your pool does too. Changing Village? Eh?! Swimming is great, but it is a bit of a faff isn’t it? There is something about good swimmers that leaves everyone else feeling a touch inadequate. I teach swimming here (well, when I say teach…) and a number of the 11 year olds are infinitely better swimmers than me. A fact that they adore and that I desperately try and forget!! Relief about the flymo, desire for the meerkat. I almost think I could consider a swim, but I am between sizes in my swimsuit wardrobe of two (the very fat one and the normal one). Is there a little shop in the changing village? And a maypole?